On 23rd January, we celebrated the birthday of one of the most beautiful people I know! She is not just a pretty face but also has a delightful mind and intellect. Her deep penetrating insights into life often amuse me and I feel fortunate and blessed that she is my sister. I was lucky to have her with me on this special day and I wanted to make the most out of it by doing what I do best and as she loves bread I decided to make some fresh bread with oven roasted vegetables, hummus, grilled eggplant dip, a very flavourful tomato and cheese pasta with the piece de resistance “the chocolate ganache cake”! My sister loves to take candid pictures of me cooking so we managed some shots here, of me mixing in the spices into the vegetables which were to go into the oven. I have to mix in the spices with my hand as I feel it is the best way to coat the spices and also results into a more flavourful dish as opposed to mixing them with a spoon or spatula before it is introduced to heat. I was making bread after a long time and as my kitchenaid sprung into action, I could feel my heart leap in joy! I love making bread with instant yeast. On many occasions I have picked up fresh yeast and have had to toss it as it has such a short shelf life and I didnt get around to making bread during its residence in my refrigerator. Good quality active dry yeast is also hard to come by and I have had to cancel many plans of making bread when the yeast didnt froth. Ever since I have met instant yeast my bread making life has been a breeze. Easy to use, has a long shelf life (I buy one of those big packs and store it for upto a year in the refrigerator) and never ever fails to rise to the occasion. You have read it before and I only want to reiterate that baking bread can be so therapeutic and elevating. And when you see that perfect loaf coming out of your oven, the happiness you feel within is only second to that of what you feel when you see your loved ones enjoying the fruits of your labour. The immense satisfaction I felt while munching into this focaccia bread is also proof that it is a great way of treating yourself! 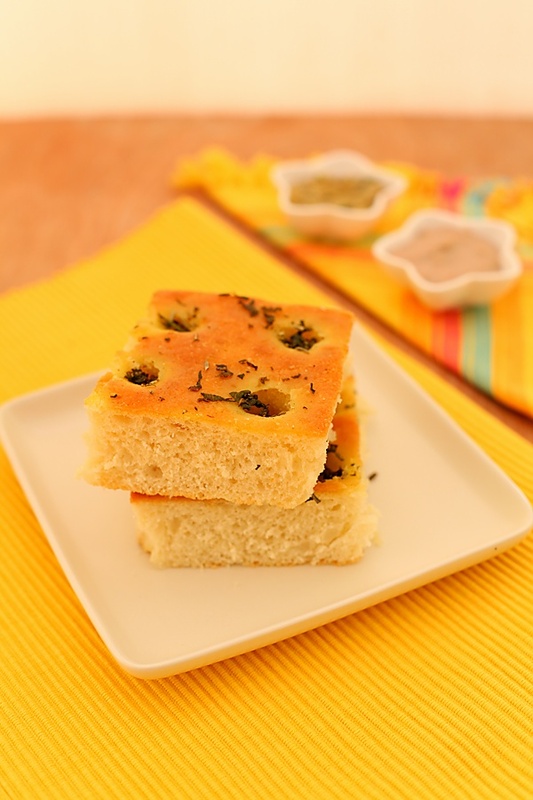 This recipe, undoubtedly yielded the best focaccia I have ever tasted, a golden brown crust infused with the heavenly aroma of the herbs and a delicious, soft base with the perfect bread texture. 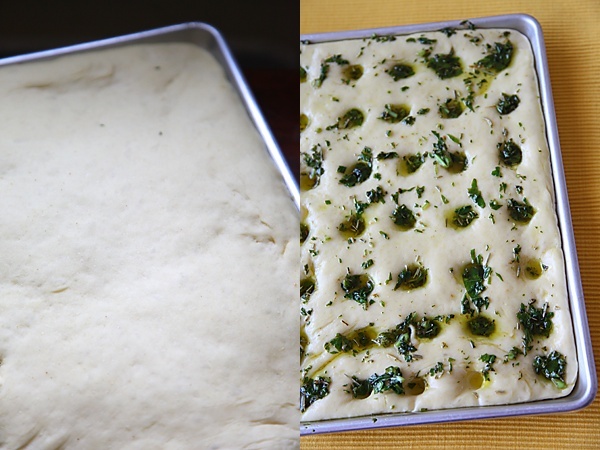 This would always be the focaccia I would serve my guests, unless ofcourse my experiments in the kitchen have the capacity to surprise me with even better results. Don’t let the lengthy recipe fool you as this is one of the easiest recipes that will give you a good loaf provided you follow it properly. And since I have used instant yeast here, I didnt even have to prove the bread twice, which is a huge time saver. Good food which is an effort of your labour, the people you love to share it with, the smiles, joys and satisfaction of those around you, some great music and conversations, these are just a few things that bring pleasures in life and make the sailing seem smooth even in what may seem as turbulent times. 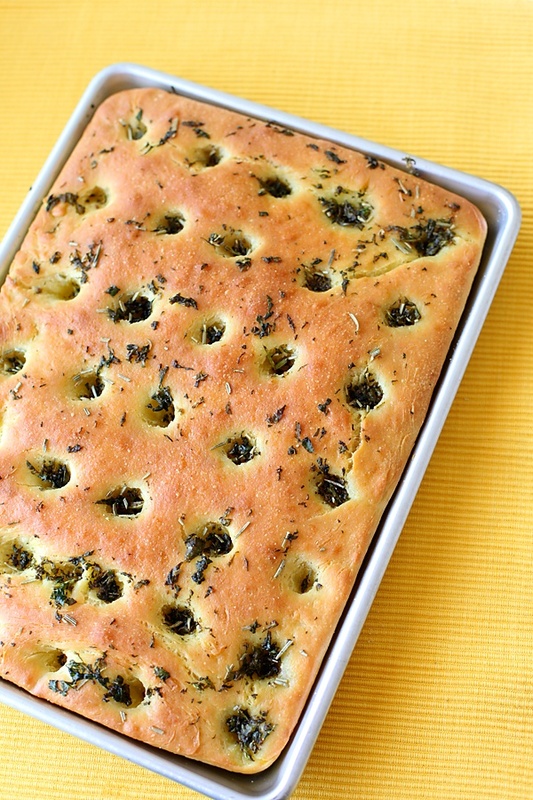 Watch how to make my Basil and Rosemary Focaccia Bread below! Heat the milk and turn off the flame. Stir in the sugar into the hot milk. When the milk is lukewarm sprinkle the yeast and allow to rest for ten minutes. Into the bowl of a stand mixer or a food processor add flour and salt and mix well. Stir in the oil and yeast mixture. Use the paddle attachment, if using a stand mixer and mix until the dough comes together. Then use the dough hook and knead for four to five minutes. If using the food processor use the steel attachment and there is no need to change the attachments in between. Alternatively mix by hand and use the base of your palms to knead into a smooth pliable dough on a work surface or a clean kitchen counter. Allow to rest in a warm place for 1 1/2 to 2 hrs until the dough raises and doubles in size. It could take a little longer if the weather is very cold. Once you put the dough to rest, you can prepare the topping. In a small wok or saucepan, heat the oil. Stir in the asafetida and the herbs and turn off the heat. Allow the flavours to seep into the oil by allowing it to rest for half an hour to an hour or longer if possible. After the dough is raised and doubled in size, make equally spaced indentations with your thumb or forefinger. Pour the herb topping evenly over the top. This may seem like a lot of oil in the beginning, dont panic as this is what will create the perfect crust and give you perfectly seasoned bread. Bake in a pre heated oven at 200 C/400 F for twenty minutes. Every oven is different so watch carefully and make sure your bread is not overly browned. P.S. The oil continues to seep into the bread even after it is out of the oven. Allow it to rest for 5 to 10 minutes and then be prepared for one of the most exotic bread experiences of your life. *If you want to substitute instant yeast with fresh or active dry yeast, use a yeast conversion table then at the stage when the dough comes together, roll into a ball and place covered until double in size. Punch the dough, shape and place in the tin, allow the dough to rise again and follow the rest of the recipe. I totally agree with you – the satisfaction of seeing a perfectly baked loaf beats everything!! 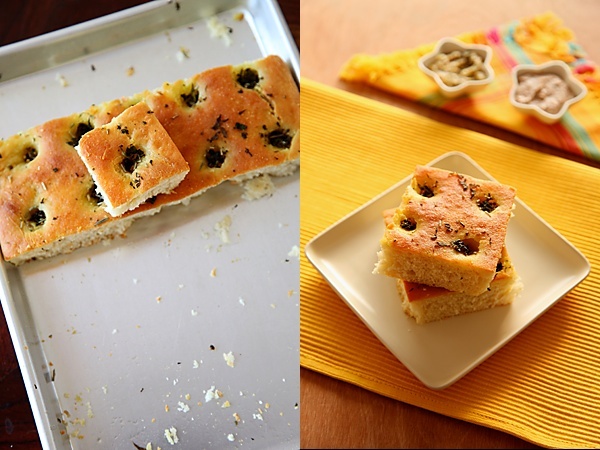 The focaccia looks absolutely gorgeous and that reminds me that I've not made this in a long time..beautiful photos, loved the yellow background! This was awesome, Anu. Thanks a lot once again for the lovely birthday delicacies. 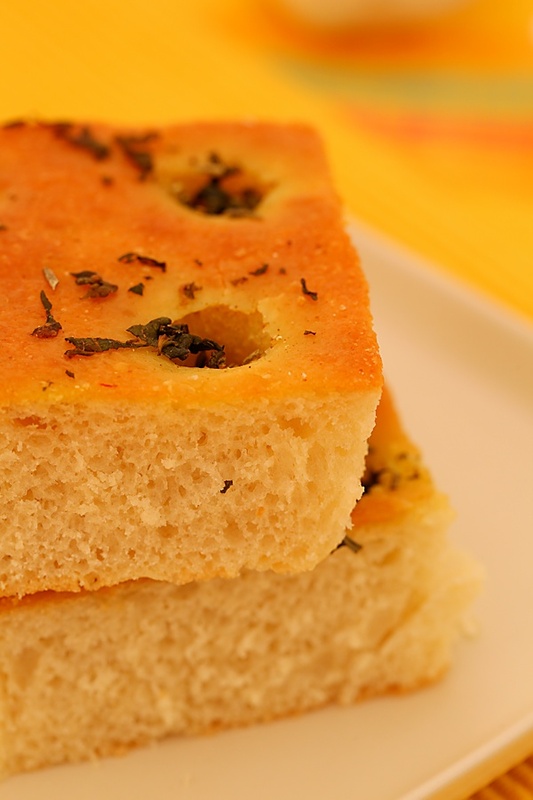 I absolutely absolutely adore this bread Anu,I've been looking for a foolproof Focaccia recipe to try.Looks way too perfect to eat:).I am sure your sis would have loved this birthday fare! This is the one recipe I've been waiting for!! What a gatronomical birthday it was 🙂 SO glad we could spend it together after 11 years!! Love the pic of your hand! Beautiful! u r ,d best!!!!!!!!!!!! !no onion no garlic…………… n a masterpiece so divine ………….well named site! Pradnya: Handling a baby is difficult I know and I have been through it and am still going through it. I hope you can make some time to cook as it can be really therapeutic and comforting too. I have never used a hand mixer but I'm pretty sure that it should work. Divya: I hope you like this, if you happen to try it. Chinmayie: Thanks! I guess one can never make enough bread! The more you bake, the more you want to do it. What brand of yeast is this, Anushruti? I love baking bread – but go through the very same yeast dilemma every single time! Bread is such a wonderful treat. I especially love foccacia and look forward to trying your recipe. Happy birthday to your sister. A perfect way to celebrate! Happy b'day to ur sis. Lovely lovely bread Anu…so beautiful and so filled wit the essence of all those herbs and olive oil. What did yiu have it with? A dill dip? YUMM-O! Jas: That was really quick. So happy that you enjoyed it! Sneha: The brand I used is mauripan. It is available in crawford market, Mumbai. I tried this recipe the exact way. The only difference being that I do not have a dough maker and I mixed and kneaded the dough with hand. But, the dough turned out to be a stiff and was not easily pliable. I did manage to roll it out though. I used the exact measure of ingredients as mentioned. Also, the dough rested for about 2.5 hours but it did not rise to double the size (just rose by 1/4 inch). I also used a good brand instant yeast to save time (SAF instant yeast, has good reviews and widely avilable in the US market). After baking, the crust was hard:(. Where did I go wrong? Do I have to add more milk or water to the dough? Thank you. Hiranmayi: Was your yeast fresh? And did your yeast mixture froth…if it froths there is no chance that the dough wont rise. This is a standard flour/liquid ratio and if you have measured correctly it should give you a soft pliable dough. Looks like the liquid was less. Please try and add the correct flour/liquid measures as mentioned in the recipe and you will get good results like the others who have tried it, myself included. All the best! Anu, I bought a new pack of yeast the day I baked it. So I'm guessing it's fresh. Also, when I mixed the yeast with milk, it settled at the top of the milk like light foam, but it did not dissolve completely in the milk. I got the sour smell and it got mixed in the dough when I kneaded it. Does this sound like its right? Please let me know. Thank you:). Hi Anu, The bread looks out of the world! I have a quick question: In the post you have mentioned about Oven roasted Vegetables. I am curious to know what exactly goes into the oven? Do you smear vegetables with oil, herbs and salt and bake them in the top rack? Also do you cook the vegetables lightly before they go into the oven, because I Brocolli in the oven tray ? Could you please let me know? Anu, I'm going to try it again. I'll make sure I pay special attention to all the measurements. I'll let you know how it turns out:). Anu, I tried it again today and it turned out good. I had to sprinkle little water to the dough to make it a little more pliable. I guess that's because I use whole milk and it's thicker than skimmed or 2%. Thank you once again for your patient replies to my queries. Btw, I also followed your recipe for carrot halwa and it turned out to be really tasty:):). @Ashwini: The vegetabes are first tossed in olive lil, herbs, seasonings like paprika or pepper and then baked in the middle rack of the oven. They are not precooked. I love to cook vegetables this way. It preserves the flavours and the nutrients and tastes fabulous! Hiranmayi: Glad it worked for you this time. If you find the dough, very thick and not smooth and elastic, feel free to add a little water spoon by spoon, until you get a smooth and pliable dough. Also, different varieties of flours have different water absorbing capacities. Learning to trust your instincts is sometimes the best way to go! Made this for dinner along with a cheesy bake…. Everybody loved it! Fabulous recipe and thank you. My first time to your blog and liked the space! I love this post especially because I love to make my own bread (no way an expert but getting there) and its addictive ! Looking forward to visiting Divine Taste more often and happy following you! Gauri: Nice to hear from you! Hope you like this recipe if you happen to try it. I made this recipe – and it turned out great – had a lovely golden crust. The recipe is well written, easy to follow.. it was my first time baking bread and it turned out yummy..thanks so much!! deli & suparna: Great to know that you'll had success with this recipe and that too making it for the first time. Kudos! I am a big fan of your website and have learnt a lot from you. 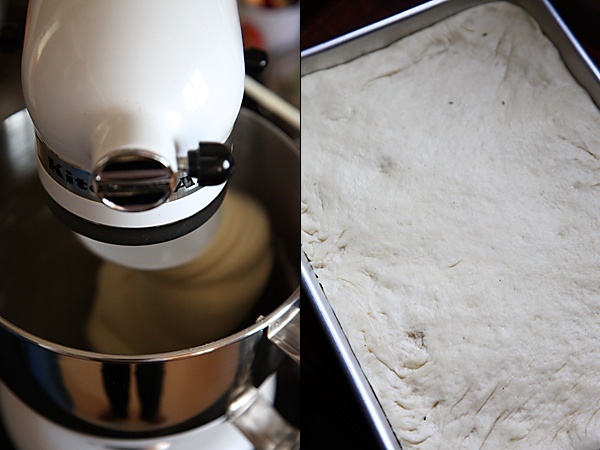 I am just now trying out this focaccia bread recipe and hope it turns out well. I was wondering, all the hummus recipes i could find on internet have garlic in it and since you dont use garlic, can you share your hummus recipe. I have a 3 year old daughter and she is a big fan of hummus. I would also like to learn your grilled eggplant dip recipe that you mentioned in this post. Mansi: Sure, will try and post a hummus recipe soon. I don't remember exactly what I put into it but I think it was smoked eggplant with skin removed and spices like mint leaves, salt, pepper and olive oil..one of those impromptu dishes that I whipped up on the spot. Mansi: Baba ghanoush is a lovely dish made with eggplants! Mansi: I must say you are quite brave in carrying on, despite things not working. Glad that your daughter enjoyed it! Hi, Stumbled on ur site from elsewhere, and I must say, it's been a wonderful find! Amazing recipes and pictures… tried out this one and my entire family, (near and extended) have fallen head over heels for it! Just a question : I used dry active yeast and added slightly less than 2.25 tsp (conversion based on a different recipe of urs). Everything came out fine but the baked product itself has almost doubled.. making it look like a cake rather than the flat bread thats seen in ur pictures. Can u figure out why? Too much yeast maybe? Thanks again for the lovely recipe collection. Keep them coming! Hi, can I use the regular ' tulsi ' leaves? As I do not have a basil plant and do not get basil leaves where I live. Aparna: Did you bake in a smaller tin? Spread the dough properly and bake in the tin size mentioned and most likely you wont face that problem again. Vaishnavi: I don't use Tulsi leaves for cooking or baking as I worship the Tulsi plant. You can try using dried basil to substitute for the fresh basil. Awesome recipe…I tried the brea with the vegetarian chilly…everyone at home relished it! You have used plain flour in the recipe right? actually do have 2 questions for you if you don't mind. Is it simply me or does it give the impression like some of these responses look like left by brain dead folks? 😛 And, if you are writing on additional social sites, I would like to keep up with anything new you have to post. Would you list of the complete urls of all your public sites like your Facebook page, twitter feed, or linkedin profile? I tried the bread but it was way too elastic-y… sticking to my hands and the processor..it smhw did not COME TOGETHER like a ball….i used instant yeast and rested it to prove fr abt 3 + hrs…pl comment..
What a coincidence ! My birthday happens to be on 23rd january and i am also a bread lover. And you know what ,all your recipes are great and i would love to try it. Alex: Nice to know that! Look forward to your feedback. Tried this for the first time and turned out really well!! We polished it off in no time 😉 thanks so much! Radhika- you can use 2 1/4 tsp active dry yeast here.Thanks for your wishes. Been wanting to try this for a long time.Can I used bread flour?Its easily available here and was wondering if I could use it ? Thanks for writing a detailed recipe . Have tried many of your recipes and love the way you write detailed instructions.Would like to know if i can use bread flour for this recipe. Priya- Yes you can use bread flour too. priya- thank you. Yes, you can use bread flour. Such an interesting recipe. I wanted to ask if I can make the dough ahead of time , refrigerate it and take it and keep it in a warm place for about 2.5 hours and bake it once the dough rises? I was thinking of making the dough today and baking it tomorrow evening. Shauna-Yes you can! Good luck! Dear Anushruti, I see that you have a kitchen aid stand mixer! I am currently in the US and have recently purchased one here. However, I'll be moving back to India this year and wanted to know if you bought your mixer from the US and if yes, is there anything you do do ensure it works fine in India? Meghana- I bought my kitchenaid in Singapore, but now it's available in India too. You can write to KitchenAid and I'm sure they will help you with this. Hi, I have made these breads more than 8 times.most of the time it turns out to be perfect n sumtimes it doesn't rise too well. I know the yeast makes it. Just a small request if u can actually put the gram measurements of instant active yeast . I use 2n 1/4 tsp as mentioned by u in one of the post. But to be presice pls help with the gram measurements. Sneha: This recipe requires 1 3/4 tsp yeast.